Let’s see what some ingredients together. Lobster seven characters, each about 100 grams. Chopped green pepper 2 tbsp. Large cloves garlic, coarsely chopped 1 tbsp. 1 tablespoon soy sauce Golden Mountain. Oyster sauce 2 tbsp Golden Mountain. Basil sauce pan with enough oil on medium heat. Add garlic, minced Stir cooked with fragrant. Add chopped basil stir fry the onion chopped chilli put my garden. Large cloves garlic Grain pepper and stir evenly, add water and season with salt, soy sauce, oyster sauce and sugar and stir with a wide taste salty and slightly sweet to finish off a light basil sauce. Wash shrimp, peeled, cut shrimp head pointed out. I’ll tear out through the mouth, tail, shrimp roll up from the bottom line to shrimp. Set the oil pan, medium heat until hot, about 1000 watts shrimp fry until golden frame the other Group scoop up the oil to drain.Use paper towel to wipe the oil may help. Heat the wok Set on medium heat until hot, add shrimp, fried and topped with a basil sauce 1 minute. 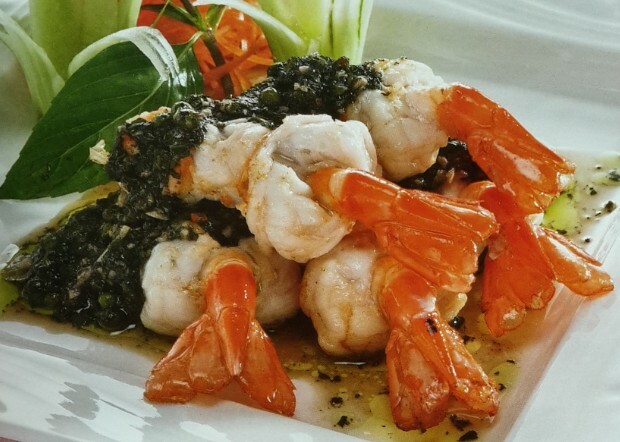 This entry was posted in Thai Cooking and tagged Thai cooking on September 1, 2015 by admin.